There are very few places with literary associations, which come as easily to the mind of a reader, student or teacher of English literature as Grub Street. More than 300 years ago, a real Grub Street gave its name to the eternal spirit of freelance writers, poets, translators, and booksellers who scraped a living on the margins of literature. The original Grub Street fed a warren of narrow alleys, closing at the northern municipal limits of London. The street took its name from “grube”, an old English word for a drain or refuse ditch. Having long had a reputation as one of the dirtiest parts of the town, where cheap lodgings were to be had, Grub Street became associated in the late 17th century with booksellers and hack writers. The word “hack” is derived from “Hackney” —a person whose services may be for hire, especially a literary drudge. In the prologue to his comedy Bury-Fair (1689), the dramatist Thomas Shadwell mocks poems written to order by worthless poets as “silly Grub street songs worse than Tom Farthing”. A common view of Grub Street writers as little more than literary prostitutes was reinforced by the works of writers like Ned Ward. One such representative Grub Street writer was Samuel Boyse who was presented in contemporary records as a typical rogue, dishonest and disreputable, and would be paid for every individual line of prose as a jack of all trades, master of none. He lived in dirty surroundings, often drunk, and, on one occasion, after pawning his shirt, he fashioned a replacement out of paper. However, it was only in the 18th century that the satires of Alexander Pope, Jonathan Swift, and their circle of selfstyled Scriblerians (from the Latin word “scribere” meaning “to write”) transformed Grub Street from an occasional derogatory epithet into the proverbial term for mean and mercenary writing. Yet this mercenary writing was strongly defended by James Ralph, a hack writer, who contrasted the trade of the journalist with the supposed hypocrisy of more esteemed professionals, “A man may plead for money, prescribe for or quack for money, preach and pray for money, marry for money, do anything within law for money, provided the expedient answers, without the least imputation. But if he writes like one inspired from heaven, and writes for money, the Man of Touch, in the right of Midas his great ancestor, enters his caveat against him as a man of Taste; declares the two provinces to be incompatible; that he who aims at praise ought to be starved… (The author) is laughed at if poor; if to avoid that curse, he endeavours to turn his wit to profit, he is branded as a mercenary”. The development of Grub Street as a comic metaphor gained force from contemporary associations of the real Grub Street and its surrounding neighbourhoods with poverty, plague, pollution and promiscuity. Its proximity to Bedlam, London’s lunatic asylum, and Moorfields, notorious for its prostitutes of both sexes, provided the joke linking Grub Street to madness and prostitution. The topographical origins are remembered in Dr Johnson’s famous Dictionary of the English Language (1765), in which Grub Street is defined as “originally the name of a street in Moorfields in London, much inhabited by writers of small histories, dictionaries, and temporary poems; whence any mean production is called grubstreet”. In dictionary terms, Grub Street also linked up conveniently with the word for a maggot, a small parasitic worm, and a dwarf or man of puny stature —all connotations that the satirists gleefully exploited in their war against mediocre writers. In Bengali, Bat tala sahitya may be referred to in this connection for their supposedly dubious literary merit. In his valuable history of the concept of Grub Street, Pat Rogers has demonstrated that for Pope and the Scriblerians the decay of literary standards was linked to deeper moral and political concerns. The moral dimension is strikingly evident in Swift’s celebrated satire on “the corruption in religion and learning” in A Tale of a Tub (1704), one of the earliest extended uses of Grub Street as comic metaphor. But it was Pope, the poetic genius of the Scriblerian group, who, in his mockepic poem The Dunciad, imaginatively transformed and developed the comic metaphor into a sustained and complex symbol of decaying values and the coming reign of “Universal Darkness”. Despite the coarse disparagement, elements of ambiguity, identification, and even affection informed the idea of Grub Street from early on. The Grub Street Journal (1730-1737), a satirical weekly in whose production Pope may have been involved, did much to blur the distinction between the Scriblerian who wrote it and the Grub Street hacks who were the target of their satire. This dilution and enlargement is evident in the burlesque drama The Author’s Farce(1730) by the novelist and playwright Henry Fielding. Although indebted to Pope and Scriblerian humour, Fielding’s Grub Street doubles as a term of mockery and a more general expression for impoverished and struggling authors in a mercenary age. The hero of The Author’s Farce, the aptly named Luckless, is himself a Grub Street hack, whose final success prompts his words of hope and encouragement in the play’s closing lines, “Taught by my fate, let never bard despair / Though long he drudge and feed on Grub Street air”. 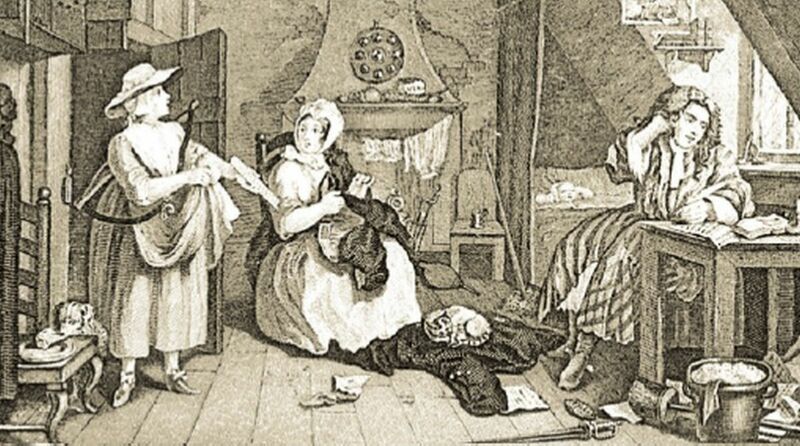 The Grub Street myth was furthered by the famous engraving by the painter William Hogarth that shows the “Distressed Poet” starving in his garret and is inscribed with the words “grub street”. Samuel Johnson was to give a personal face to this enlarging sense of Grub Street as the province of needy and neglected authors in his archetypal history of the unfortunate life and premature death of his friend and fellow writer, Richard Savage (1774; reprinted in The Lives of the English Poets, 1779). By then the political and religious concerns that directed Pope’s and Swift’s Grub Street satires were already fading into history. The real Grub Street was soon to discard its historical associations and notoriety when it was renamed Milton Street in 1830. Many believed that the new name commemorated the poet John Milton, who lived in the district briefly from 1661 to 1662 and was buried in the church of St Giles Cripplegate nearby, but the truth is more prosaic —Milton was the name of the builder who owned the lease on the land. In English Humourists of the Eighteenth Century (1853), novelist William Makepeace Thackeray blamed the satires of Swift and Pope for having caused the low social status of literary men. Thackeray was himself a voluminous contributor of burlesques and sketches to the popular Victorian press and he drew a colourful picture of the literary trade in his novel The History of Pendennis (1848- 1850). For Thackeray and his circle, Grub Street generally meant scorn for Victorian conventionality and humbug and expressed the spirit of masculine bonhomie. Thackeray, in his novels Vanity Fair (1847-1848) and The Adventures of Philip (1861-1862), gave currency to a rival term from France —“Bohemia” — to denote the free, unconventional, irregular life associated with writers, artists and actors. Robert Brough, freelance writer and younger contemporary, describes Bohemia in his autobiographical novel, Marston Lynch(1860), with more bitterness than jocularity as a hitherto unnamed “back street suburb of the sister cities of literature and art”. Brough’s “Bohemia” is in fact simply Grub Street renamed. The late nineteenth-century journalist and critic George Saintsbury struck out at both terms in defence of literature as a respectable profession for prudent and able writers. With a historian’s skepticism, he dismissed the romantic myth that had grown up around Grub Street and he vehemently criticised the idle, tavern- haunting bohemianism that had become linked to the literary and artistic life style in the 1870s and 1880s. It was at this point that Grub Street was threatened with retirement when George Gissing’s remarkable novel New Grub Street (1891) redefined the territory and gave new force and currency to the phrase. In this novel, Gissing returned to the traditional English expression “Grub Street”, instead of “Bohemia”, to denote the abode of poor and insignificant writers. The most important of the various stands that make up Gissing’s Grub Street is his forensic attention to the inglorious facts and conditions of the writer’s life — the ink-stained labours, the fear of writer’s block, and the financial pressures and personal rivalries that form the human backdrop to literature as a trade. Grub Street has passed through several shifts of meaning in its more than 300-year history from symbol of social disorder in the Augustan Age to romantic legend in the 19th century and finally to a badge of conscience and sign of 21st century academic “street creed”. Today all traces of the real-life Grub Street have disappeared. In the 1860s, the houses on both sides of Milton Street were demolished to make way for the Metropolitan Railway. And a century later, the last vestiges of the old street were swept away for development of the Barbican Theatre complex, which now occupies the site.